Dining workers and student activists rallied support for UNITE HERE Local 26, the union which represents dining workers, in their contract negotiations with the university last night in Pearson 104. Speakers repeatedly criticized how the university administration has handled the talks. Negotiations will go into their 11th round next Wednesday, according to Tufts’ Executive Director of Public Relations Patrick Collins. The meeting was led by senior Edwin Jain and first-year Georgia Kay, both members of Tufts Dining Action Coalition, the student group that organized the event. Tufts Dining workers Tina Lavanga, Lucson Aime, Trisha O’Brien and senior lecturer Jean Wu addressed the attendees. Jain told those present he was motivated to support the dining workers because his mother had worked in dining services and he remembered how difficult that was. Kay then shared a story of a manager at an off-campus job who was unresponsive to her concerns about what she felt was an uncomfortable working environment. O’Brien, a dining services attendant and a spokesperson for the workers, said the workers had gone into the first day of negotiations optimistic about their chances of getting favorable agreement from the university. However, her attitude changed after the initial negotiations. “The second day, we went in and when we left the meeting we knew it was a war. This is a war we’re in right now, because they don’t want to give us anything. They want to take more away from us,” she said. Lavanga, who has been employed at Hotung Café on temporary contracts for nine years, said that Tufts’ use of repeated temporary contracts like hers is unacceptable, and that Tufts is refusing to meet the union’s demands. Aime, a first cook at Dewick-MacPhie Dining Hall, told the crowd that during the months of negotiations he has occasionally grown disheartened, but the support of the students and his colleagues has kept his spirits up. “We believe that one day we will tell our children, ‘This is what we did here at Tufts. We changed Tufts, where people come to work and are able to raise their family and have health insurance,’” he said. Wu, a senior lecturer in American Studies who spoke next, accused the university of treating its workers like objects and lauded the impact the unionization of lecturers had on her colleagues. 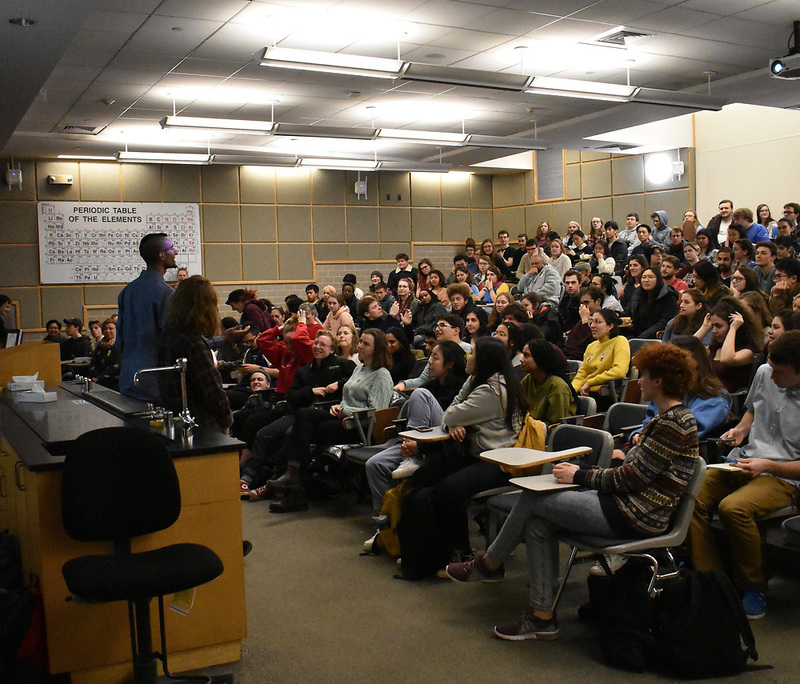 “It is really important that we saw faculty lives and teaching people’s lives change after the union change, first for part-time, non-tenure-track lecturers, then full-time, non-tenure track lecturers,” she said. Kay closed the event by encouraging attendees to wear the “We Love Our Dining Workers” buttons available at the meeting on Jan. 22 to show their support. The assembly joined in a “unity clap,” a practice Jain said had been employed by the United Farm Workers. Samee Mushtak, a junior who worked as a dishwasher in Dewick, said that he attended the meeting to support the friends he has made among the dining staff. After the meeting, Kay told the Daily she felt it was crucial to galvanize student support as the negotiations head into their second semester and that student activism would influence the administration. “It’s been going on for a long time, but it feels more pivotal than ever now that everything is on the table, and I think that there’s new level of pressure on the university to comply with the union’s requests,” she said. Aime said he felt reassured by the meeting. “I feel alive, I feel there’s hope, I feel more confident that the students have our backs and that they’re really supporting us and the atmosphere was really good,” he said. Collins, executive director of public relations, said that the two sides have already come to an agreement on 10 of the 30 issues that have been discussed. On Dec. 13, 2018, the university presented a series of proposals to the workers on the outstanding issues, including on the subject of wages. The workers then offered counter-proposals on Dec. 20, 2018, but these did not address wages, according to Collins. Collins said these proposals are currently under review. “The main sticking point is that the union has yet to provide us with a wage scale. Until we understand what their wage proposal looks like, it will be difficult to move forward,” Collins told the Daily in an email. CORRECTION: An earlier version of this article stated that Trisha O’Brien is the lead negotiator for the workers. The article has been updated to clarify that she is a spokesperson. The Daily regrets this error.